Check out what our guests have to say about us. I chose this place based not only on its location, but also other reviews, and they didn't let me down. It had everything I was after for just a brief overnight stay on a long road trip. The room I stayed in (#6) was immaculately clean, the decor was lovely, ample tea/coffee making facilities and also little packets of biscuits (lovely little touch), fridge, and microwave if needed, and a nice sized shower. The bed was SUPER comfortable, so much so that I slept in for an extra half hour. It was a quiet place, even though it was near the road. Check in was smooth and quick, and I loved all the giraffes and African art decor in reception. I highly recommend Motel Kempsey, and will definitely stay here again if I'm ever passing through or needing to stay in this area. Exceptional service began with welcoming email before my arrival ensuring my requirements were all met. The same high standards were maintained during friendly check-in, hearty breakfast, stylishly appointed and very comfortable room and overseen by Maggie the pet bird who keeps an eye on things to see it all runs smoothly! 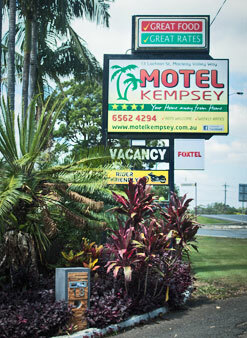 Motel Kempsey is old-fashioned country hospitality delivered with seamless professionalism and fastidious cleanliness and attention to detail. When I say benchmark I mean benchmark! I’m not easily impressed and I have never given a hotel review this good before. This property and its proprietors have set a new standard by which I’ll determine what value in "hospitality" actually means from now on. Thanks Karen & Jason for an outstanding guest experience!. What a pleasant surprise, a first for us from a local country motel that we have stayed at, a positive for future business. Although we only had a standard room, the size, presentation, appointments and cleanliness were very good, in particular the comfort of the queen bed. If we travel to visit family again via the Pacific Highway without our caravan, and require a bed for the night, we will make sure we try to time our distances so that we are able to spend another night with you. Thank you for your email - we had a great stay. Service was lovely from you Jason, especially going above and beyond to help me find some headache tablets for my husband after a long day driving and we both had a fantastic sleep in the bed, which was so comfy with clean, crisp sheets. The room was also clean and comfortable for our stop over. I'd gladly stay again. Please feel free to use this feedback on your website or similar.